The Long Branch Torrey Pine Lives! The Torrey Pine on Long Branch Avenue has been saved! The tree was on the agenda of the OB Planning Board and tonight was the showdown between the City and tree proponents – or it was supposed to be. But, in a dramatic reversal, the City has determined that the tree is healthy and stable, and DOES NOT NEED TO BE CUT DOWN. Tree proponents and most members of the Board were elated with the City’s new position. Hasan Yousef explains the City's reversal. A month ago the City wanted to cut the Torrey Pine down. Now it has determined the tree is healthy and stable and will not cut it down. The City, represented by Hasan Yousef, publicly stated that the City will not cut the Torrey down, and that based on new evidence – mainly from the community-sponsored exam of the tree – it is stable and healthy. The City also agreed to trim some upper foliage, to repair the sidewalk without damaging the roots, and to actually create a “pop-out” on the curb side of the tree. The tree will be monitored, he said, and an arborist would be on site during any pruning. Yousef did say that if the tree appears to be an immediate hazard by beginning to fall or move drastically, the City would take immediate action and cut it down. But, Yousef added, no one expects this to happen anytime soon. Yousef, the boss of earlier representatives from the City like Mary Wolford and Drew Potocki – who were not present at the public meeting – delivered the stunning announcement about the City’s turn-around at tonight’s monthly meeting. After finishing speaking, Yousef even drew applause from the audience. Tree proponents did speak, but it was over. The drama was over, everyone was relieved. 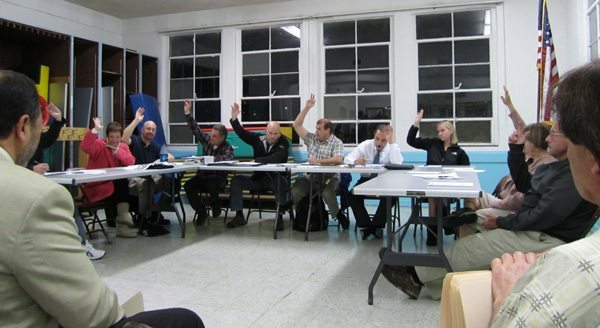 The battle to save the Torrey Pine at 4633 Long Branch had been won. 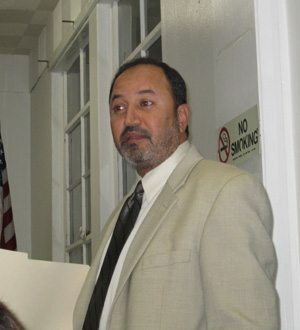 Many Board members declared that they were very pleased with the City’s decision, and these declarations went down the line – Seth Connolly, Barbara Schmidtknecht, Craig Klein, Vice-chair Landry Watson, Ronnie Shamoun, Jane Gawronski, and most others had smiles, like Chair Giovanni Ingolia. In a brilliant move, Gawronski made a motion to memorialize what the City was promising that evening, to make it part of the Board’s record, the not cutting it down, repair of the sidewalk without hurting the roots, some pruning, and monitoring. This passed unanimously. Several Board members publicly acknowledged the role that watchdog members of the community played in bringing the issue of the tree to the Board. Watson even went on to say that if the watchdogs hadn’t acted, somebody in the bureaucracy would have simply made a decision to cut down a healthy tree. One of the key lessons of the evening and of this entire scenario that was played out over the last two months, was that the City was forced to deal with the Planning Board on an otherwise bureaucratic procedure – an action however that would have harmed the community by cutting down a perfectly good, protected tree. The City was brought to the forum that the Planning Board provides and represents, and made to prove something to the community before it went ahead with its original plans. And importantly, the City bent to the pressures from the community. Yet, it took citizens hiring their own arborist to come down to the tree and do their own examinations and evaluations before the City was willing to listen to the villagers. But it did. Tonight the Torrey Pine on Long Branch – a tree that has withstood the sands of time of some 80 years, that has withstood the wind and rain storms of this past month and over the decades – can rest a little easier. It has been spared an execution that some sought but most did not. For in the end … The tree lives! Richard Agee has championed the cause of this Torrey Pine from the very beginning and should be given all due credit because without his foresight and dedication there would now be a huge hole in the canopy on Long Branch Avenue. Thank You Richard… Three cheers for Mr. Agee ! creeze, yes i agree but without the obrag richard’s stand for the tree would have been a lone voice howling in the windy storms that beset this shoreline hamlet. And thanks to all who came out in support. Great news! Wish I could have been there! Apparently, Mr. Yousef realized that the words and actions of his subordinates could not stand up to public scrutiny. At the OBPB meeting on December 1, Drew Potocki insisted that the tree must be removed before the next winter storm or it may fall. He used fear tactics to justify removing the tree, including references to the safety of children and school buses. He cited several reports from fellow city employees and contractors that supported his view. been shown to be healthy and stable, even after the storms. It is a shame that Mr. Potocki was not present at the meeting to retract his own statements. This entire episode came to light when Richard Agee happened to drive down Long Branch and noticed a white X painted on the Torrey Pine tree. He recognized that white X from his previous experience with Drew Potocki and the palm trees, and took action. But this time, no healthy trees were lost unnecessarily. Congratulations to Richard Agee, Frank Gormlie, Theron Winsby and all the citizen activists who saved this tree from Drew Potocki’s contract chainsaws. This shows what can happen when citizen activists do their due diligence behind the scenes, dig deep to identify “inconsistencies” by city officials, orchestrate an independent effort to hold the city accountable, and use the available media to inform the public. Well done! horray and well done folks! its great to see that the community still cherishes Mother Earth and is willing to step up to the plate when it counts!!!!!!!!!!!!!!!!!!!!!!!!!!!!!!!!!! wonderful news and kudos to ALL who helped the tree retain its rightful place in our community. I would like to add to the cheers for Richard Agee, he was the one that galvanized everyone. But, I would also like to thank Frank Gormlie and the OBRag for the greatly detailed stories and helping Richard. And thanks to Theron Winsby for his professional assessment of the tree. I have nothing good to say about the City of San Diego for it entire approach to this matter, their behavior, except for the final decision they had no choice but to make, was abysmal. And thanks to the OBPB for handling their part very well. Speaking as a private citizen, and not for the OBPB, I was happy that a constructive solution was reached, and give credit to the community members, City staff, and arborists who participated in this process. I do feel bad that some City staff are getting a little demonized in this, as public safety was to me a very legitimate aspect of the discussion. if public safety was what motivated the city’s employees to act, perhaps they could spend their time focusing on other safety concerns and leave the trees alone. there are other crimes in this area (theft, graffiti, drug abuse, etc.) to cause the city to rethink its efforts. I never felt threaten by the tree, yet every day wonder what will be stolen off my property or my neighbors property next. perhaps i could plant several torrey pines around my property for more security. seth, yet what i have read on the blog the city people wanted to cut the tree down without any real evidence that it needed to be cut. they were ready to go get the saws. now i was not at any of the planning commmittee meetings. the ample reportage on this issue, if accurate, shows the city people just a little too eager to do some chopping. this is the source of any animosity i would suppose. but again all i have is local media reports – and i have not seen all that much “demonization” of the city people. City staff was “demonized” because they came before the public with absolutely no credible information that there was a safety hazard. Their alleged arborist “reports” simply did not exist. The tree looks the same today as it did in 1996. Anyone with a modicum of construction experience could look at the sidewalk and wall damage and easily see there was no indication of earth upheaveal. They had a hidden agenda, rip out the tree so they could fix the idewalk more easily and not have to maintain the tree. There simply was NO public safety aspect of the discussion, that was pure fiction. Their attempt to scare the public into killing this tree was reprehensible. Potocki did not show up at the meeting, did he? That was very telling. Frank Gormlie, the OB RAG, OB Planning Board, and the community who came out to save this beautiful tree. It’s a triumph for activism. Older Article: Save a healthy Torrey Pine – Come to tonight’s Planning Board meeting.